I found myself back in San Diego, California for the second spring in a row for a conference. Last year, my sister-in-law and her three kids were living in Coronado while her husband was out to sea. This year, I’m flying solo in San Diego with a day or so to kill on either side of the conference. 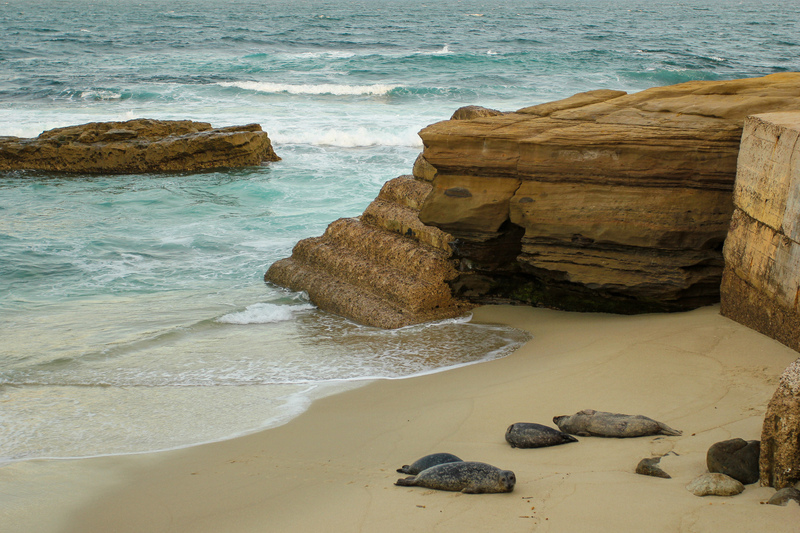 If you’re planning a spring trip to San Diego, here are some recommendations to get inspired! 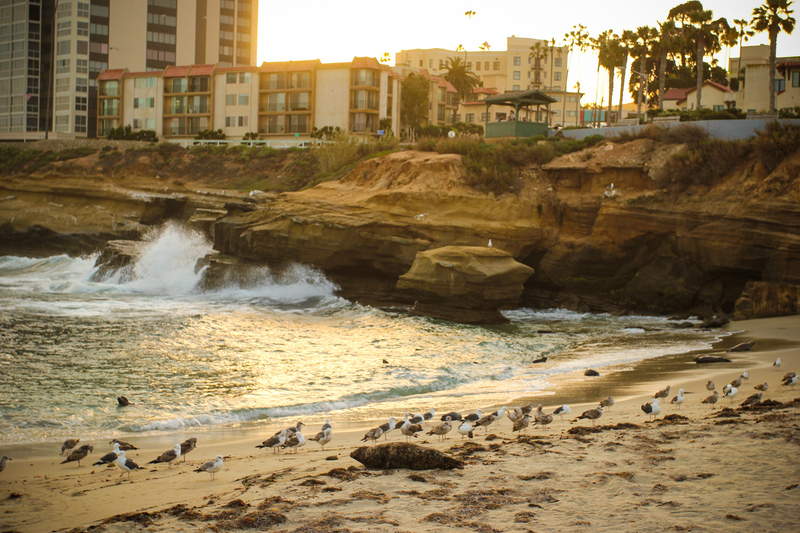 Below are the things I did in San Diego primarily on this trip, with a nod to a couple from last year, as well. Paradise Point is the home of the SearchLove San Diego conference each year, and is a great fit for gathering 250 or so super smart marketers to see some of the best and brightest in the industry speak. It has become my new favorite conference in my industry because it is more intimate, shorter, more advanced, and more talent-selective than many other conferences in the industry. The conference room space is well set-up with excellent wifi. The catering is always well-executed and conscious of folks with special dietary needs. 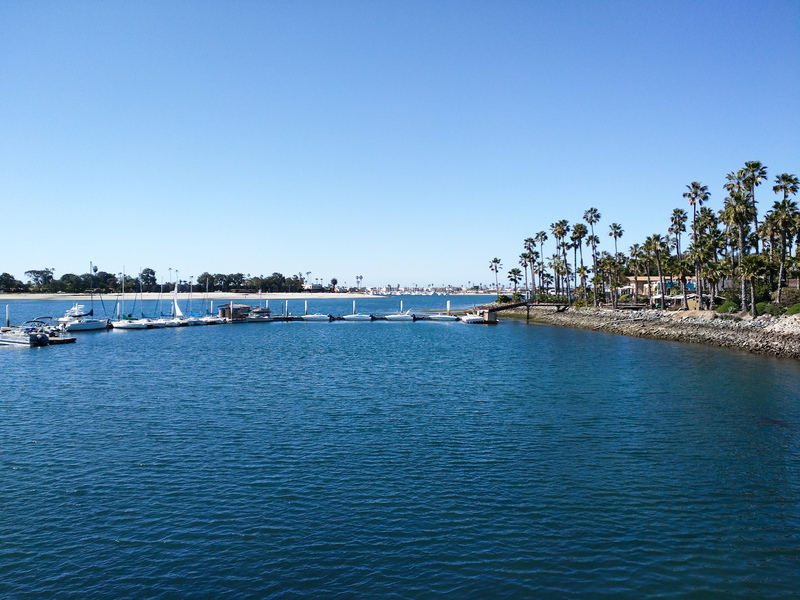 And the breaks are so refreshing with sunny views of Mission Bay. I sometimes joke that Paradise Point is a “compound” because it is a self-contained resort with a handful of restaurants on a 44-acre “island” with all of the guest rooms, five swimming pools, tons of open beach line overlooking Mission Bay, and of course things like mini-golf and fire pits for bonfires and grilling. It really is a lovely place and couldn’t be more a convenient, accommodating, and relaxing setting for a conference. 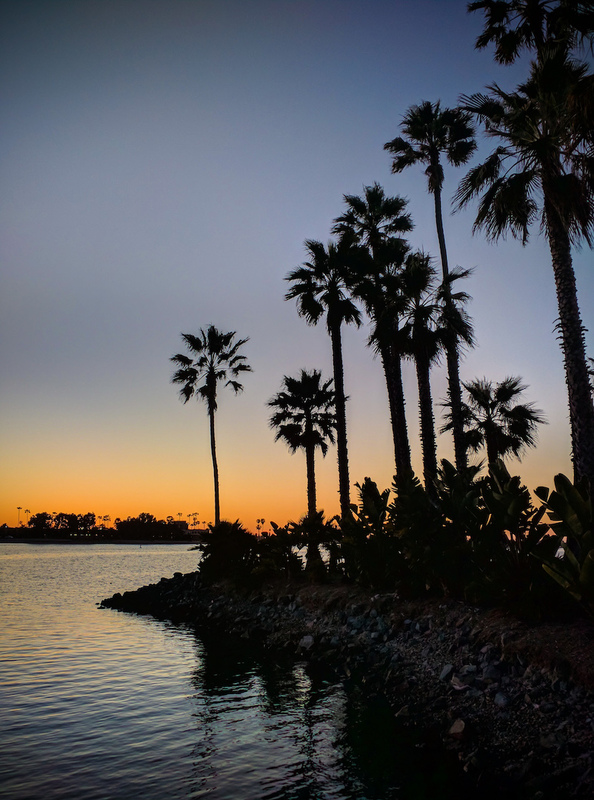 It also has numerous pleasant views – not just the waterfront and palm trees, but also some photogenic sunsets over Mission Bay. 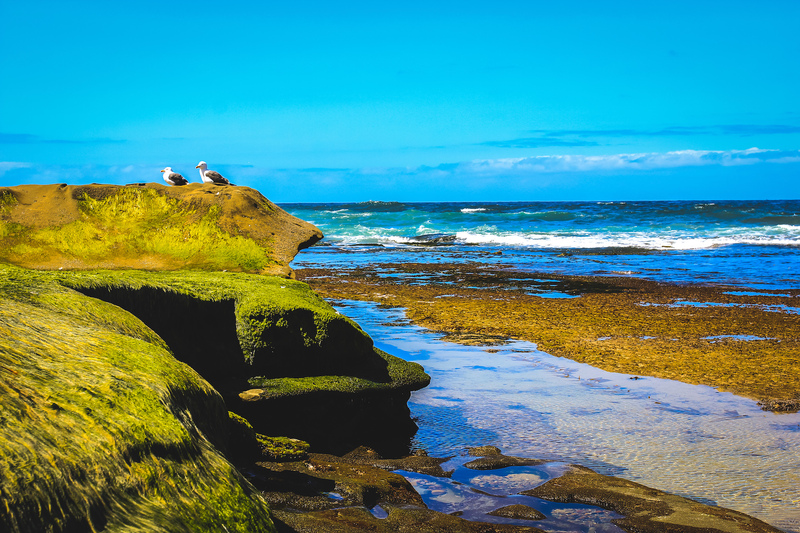 I had some time to kill and I wanted to get straight to the water, and La Jolla Cove was just a short drive away. Parking at La Jolla Cove directly was tough to find, but just one block over on Coast Street, I had no problem finding free street side parking on a sunny Saturday afternoon. 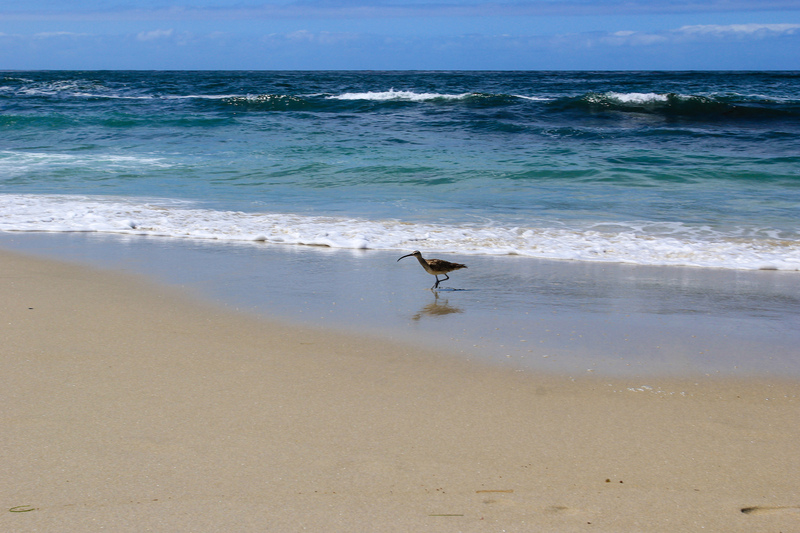 This beach has come highly recommended for its simple beauty. At low tide there are lots of tide pools in the sands to look for tiny creatures. 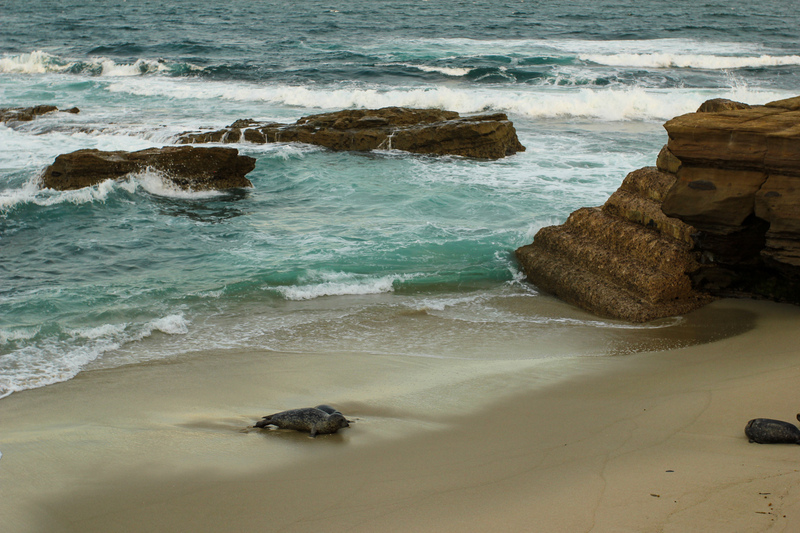 It’s a nice walk along the beach with lots of sand, sandstone, and gentle waves to see. If you walk further south toward the tide pools, it is markedly less busy, though there are still people poking around for seashells in the sand. Because arriving in San Diego is going back in time from Kansas City, I arrived in-city before 9 a.m. I snagged my rental car (a shuttle ride from the San Diego airport) and headed straight to Saturday brunch at Shorehouse Kitchen. 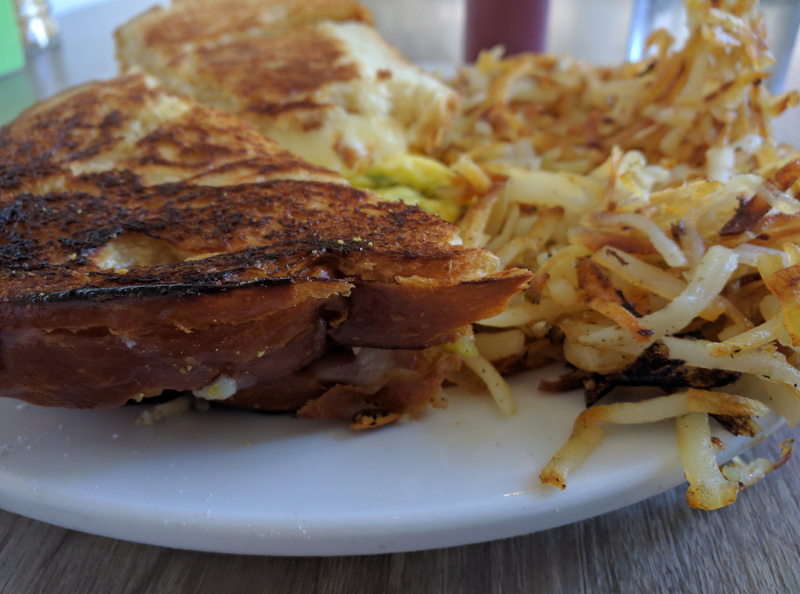 I ordered the Brioche Breakfast Grilled Cheese Sandwich, with an organic spinach and aged white cheddar omelette and a slice of tomato on fresh brioche from the local Bread & Cie Bakery, with a side of their crispy hash browns. The omelette was delicious without overstating the cheddar, and the toasted brioche was tender and flaky inside that egg-washed crust. There was something uniquely delicious about the flavor of the hash browns – I couldn’t put my finger on it. The meal was a little on the oily side – a bit surprising for the caliber of local ingredients they carry, but not a deal-breaker for me. If you have an active day a head, no harm – but be mindful if you are diet-conscious. 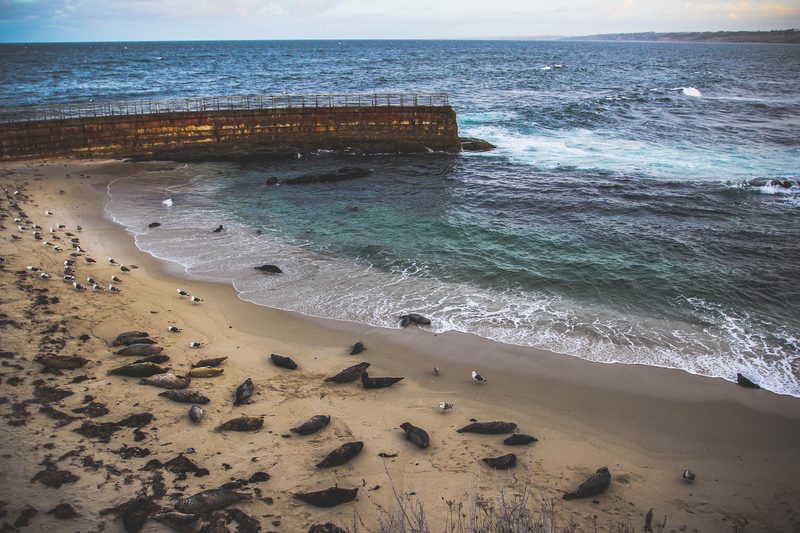 I have wanted to see the harbor seals at La Jolla Children’s Pool for a long time, so I got out of bed at around 6 a.m. to try and catch them in the morning light. I practically had the spot to myself at this hour, and it was nice just to sit and watch them in the cool morning ocean breeze. It is seal pup season, and there is lots of signage reminding visitors not to get too close to the seals as it could lead mothers to abandon their pups – so respect the animals and keep your distance. There were lots of moms lounging with their pups, several seals coming and going on the beach, and a few playing in the water. It was quiet and peaceful, save for the occasional seal barking. 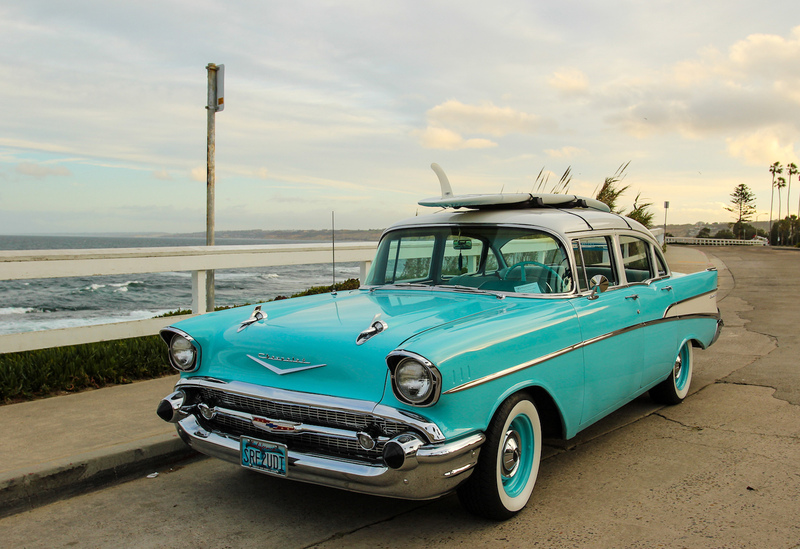 I also saw this baby blue ’57 Chevy parked beatifically in front of the beach. It was very intentional placement from @robertthesurfer – but you won’t hear me complain about a cool photo opportunity. I noticed that a ton of places in San Diego were dog-friendly, and Parakeet Cafe was no exception. 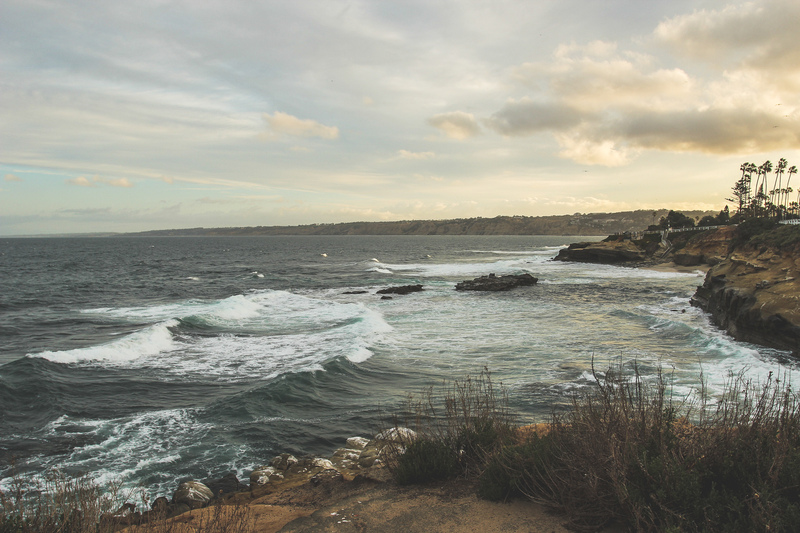 I loved this cozy little spot in La Jolla! The service was amazingly friendly bright and early in the morning, and it was clearly a beloved neighborhood staple. They were as friendly to the adorable dogs passing through as they were the human customers who accompanied them. It seemed that the staff knew many of their guests by name, and they were quick with a friendly comment and a recommendation. 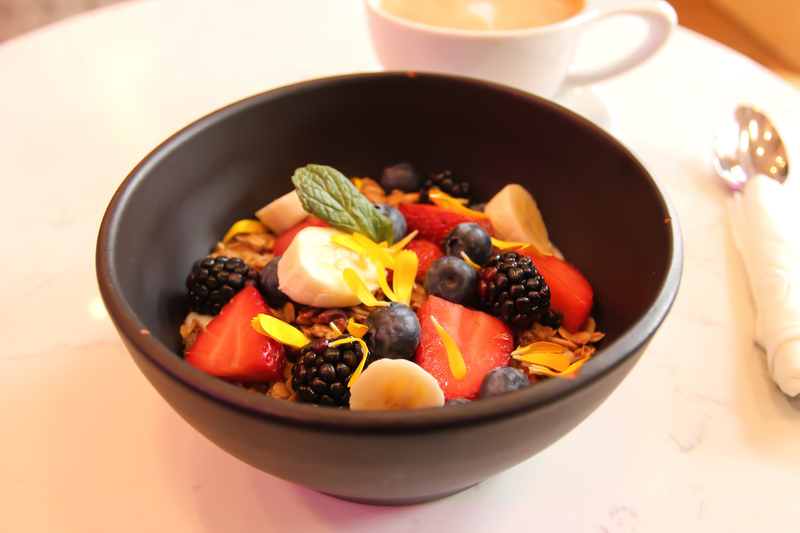 I had their coconut milk latte (delicious) and on the staff’s recommendation I had their organic coconut yogurt bowl. I am so, so glad they pointed me to this dish. Not only was it elegant and beautiful, but it felt healthy and balanced with fresh berries, bananas, crunchy and sweet granola. It also had one surprising, colorful little ingredient that brightened my morning – edible flowers. 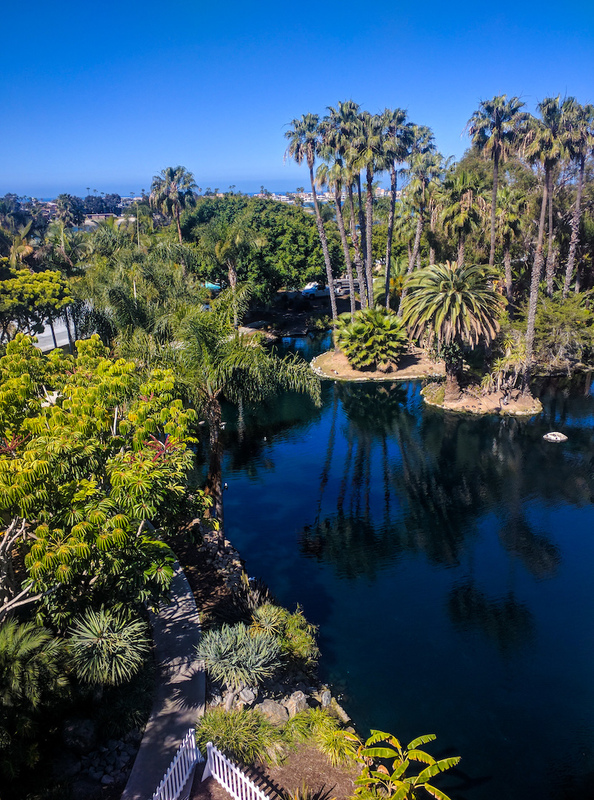 I visited Balboa Park both times I was in San Diego. The first time I visited was to see my sister-in-law and my two nephews and one niece. 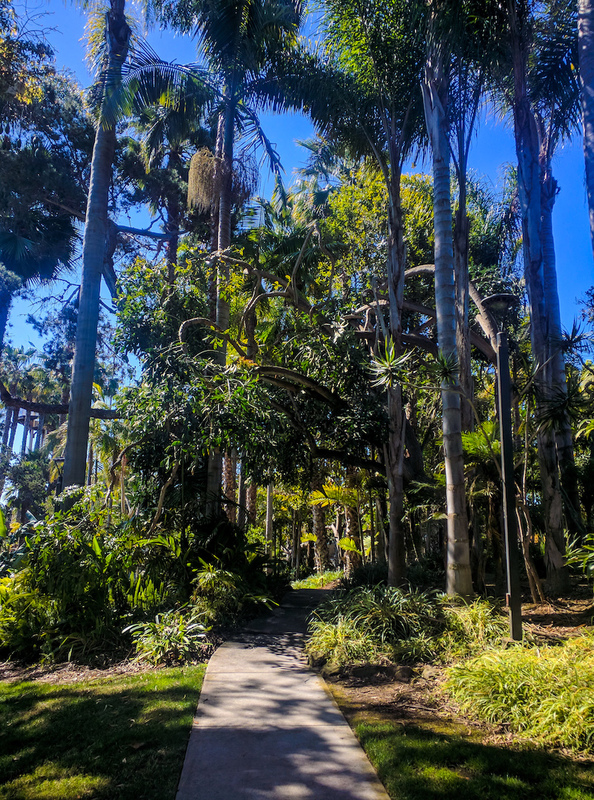 Balboa Park is a super family-friendly place where kids can play and all of us can get our learn on. Watching my nephew Oliver dance to the street musicians and my niece Penelope shrieking as a group of kids got to help make giant bubbles on the sidewalk is high up on my list of favorite things. The first time I visited we wandered through several International Cottages and spoke to a few expats, checked out their artifacts and occasionally had a snack local to that country. We checked out the Museum of Photographic Arts which had some fantastic exhibits I could have spent hours on hours within, reading every word. 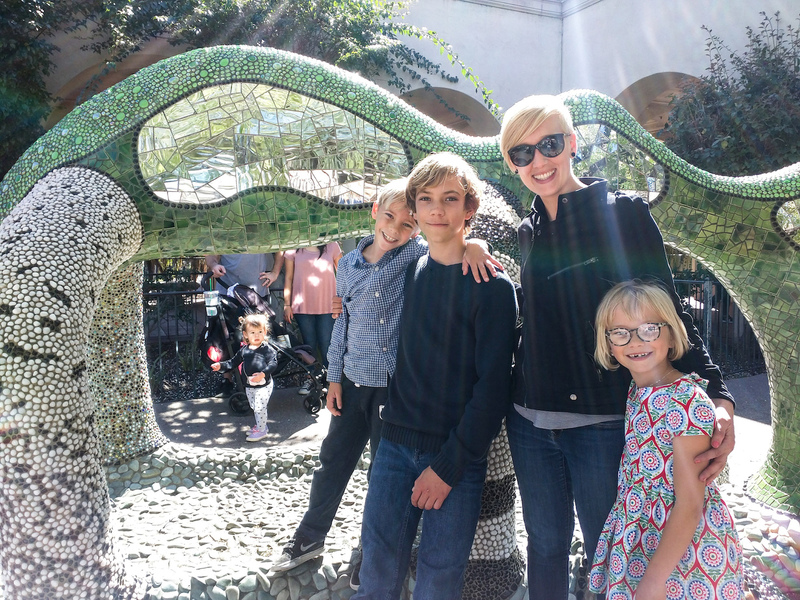 The grown-ups also popped into Café Mingei for a quick cup of coffee to keep up with the kids, who were either watching skateboarders fly off the stage at the pavilion and miss tricks time after time or climbing over the mosaic dinosaur. This time on my own, I went straight to the Museum of Man in Balboa Park. I would be lying if I said I wasn’t lured by the temporary Cannibalism exhibit. I don’t know what that says about me as a person. Naturally, the special exhibit covered the Donner party and the Chilean Rugby team that crashed in the Andes, cannibalism in literature and history, and how much of a douche Christopher Columbus was. 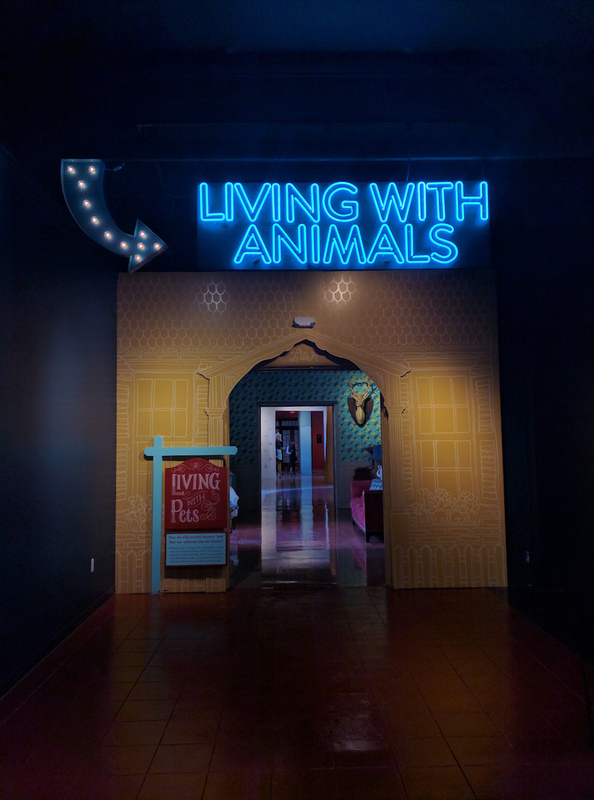 The Museum of Man also had some nice exhibits about the history and geography of beer, the ancient Mayans, and Living with Animals – as companions, as workers, and as food. We have to talk about this meal. It was outstanding. I enjoyed every second at Ironside Fish & Oyster! The restaurant came highly recommended by some industry colleagues, so I made my way to this seafood hot spot in the Little Italy part of town on a crowded Saturday night. 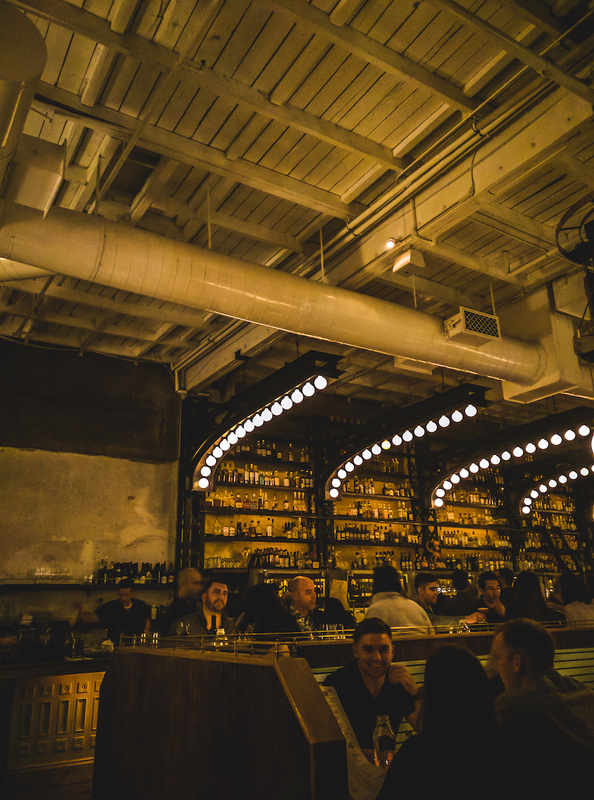 There was an expected 75-minute wait without reservations, so I recommend reserving a table ahead of time. However, being a party of one willing to sit at the bar easily got me a seat within 10 minutes. I started with a glass of rosé and half a dozen oysters. The server recommended a chef’s selection with one of each of their featured oysters. All six were west coast ranging from British Columbia in the north, to Washington state, to the coast of Baja Mexico. I love my oysters raw and straight as they are, but I also love a good fixin’ – their horseradish and special cocktail sauce were great additions. The Baja oyster was my first taste – it was super salty as if I had taken a shot of the ocean. It was good, but the Washington state oysters were even better. However, the Phantom Creek British oysters were so delicious I ordered seconds later in the meal. 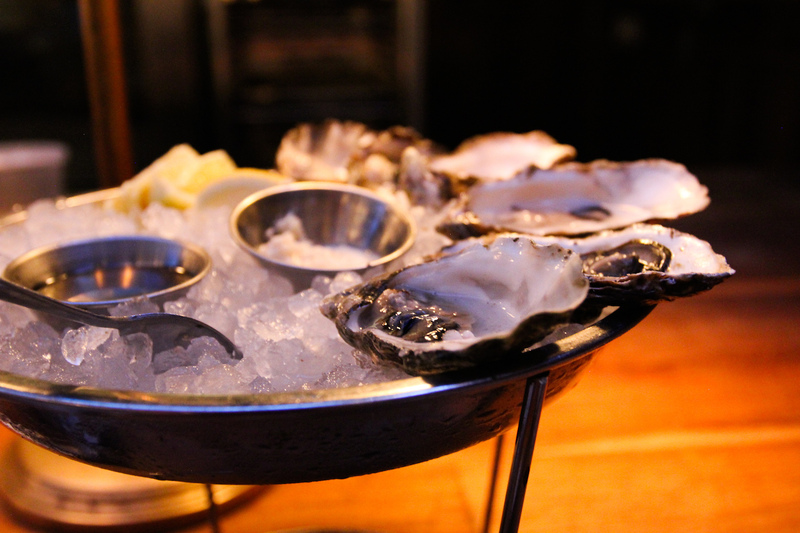 While the oysters were slow to come out from the oyster bar, they were worth the wait. I also tried the Ironside bread. It was fresh-baked daily, perfectly soft and fluffy with an ever-so-slightly crunchy outside crust served with whipped butter. But the most beautiful thing about this bread – it surprised me with this delicious scent and taste of citrus. The baker at Ironside used orange in the recipe, a perfect compliment to my seafood dinner, and the leftovers made an outstanding breakfast the next morning. Next, I ordered a crab cake with their remoulade – I am partial to Maine lump crab cakes, but this San Diego crab cake was great too, and really hit the spot. I can neither confirm nor deny that I whispered, “Good night, sweet prince,” as I took the last bite. One add-on I sprung for at the last minute was the Japanese sweet potatoes with fluffed quinoa and scallion chimichurri. Chimichurri is typically found on red meat dishes, like my husband’s steaks, and I rarely get to enjoy this burst of flavor. It was so refreshing to have a vegetarian-friendly dish with chimichurri! These were so yummy and the sauce was so vibrant and punchy. Just two doors down from Ironside Fish and Oyster is an ice cream shop called Salt and Straw. I had not heard of this shop before, but apparently it originated in Portland, Oregon and has expanded to San Diego, San Francisco, Los Angeles and Seattle. Now there is absolutely no reason I needed ice cream after that huge meal at Ironside, but it had a line around the corner both before and after my dinner and I just had to know what the fuss was about. The shop is reputed for its carefully handmade ice cream with highly unique flavors, including exciting short-term flavors that fans can vote to bring back to the menu. Ultimately, I gave up on the line to wait for a waffle cone and a monster scoop of ice cream – but not without grabbing salted licorice as a take-home gift for my husband, and a pint of their Smoked Sea Salt with Chocolate-Covered Fueilletine out of the fridge to skip the line. What is feuilletine, you ask? Great question. I had to Google it, too. It’s basically crispy, flaky pastry chunks with caramelized praline flavors reminiscent of a sugar cone. This ice cream is cherry-wood smoked sea salt vanilla ice cream with chocolate-covered feuilletine gentle folded into it. According to the menu on their website, this chocolate coating comes from a tempered single-origin chocolate from Woodblock Chocolates in Portland and the salt is Japanese cherrywood-smoked salt from the craft salt shop,The Meadow in Portland. You guys, this ice cream is delicious. And RICH. So rich. It’s the sea salt in it! It was ultra-satisfying with a very small portion, so keep that in mind when ordering. I do recommend giving this place a shot. Hiking is my jam y’all. 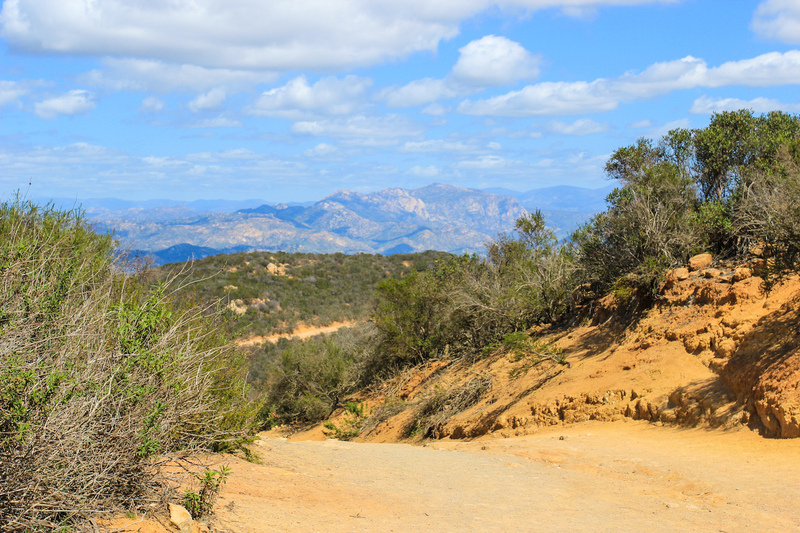 I’ve done two hikes in San Diego on the last two trips worth recommending. This time I deeply wanted to do Three Sisters Falls, but it’s about 90 minutes away from where I was staying and I just couldn’t make the timing work this time. Note to self for next year. 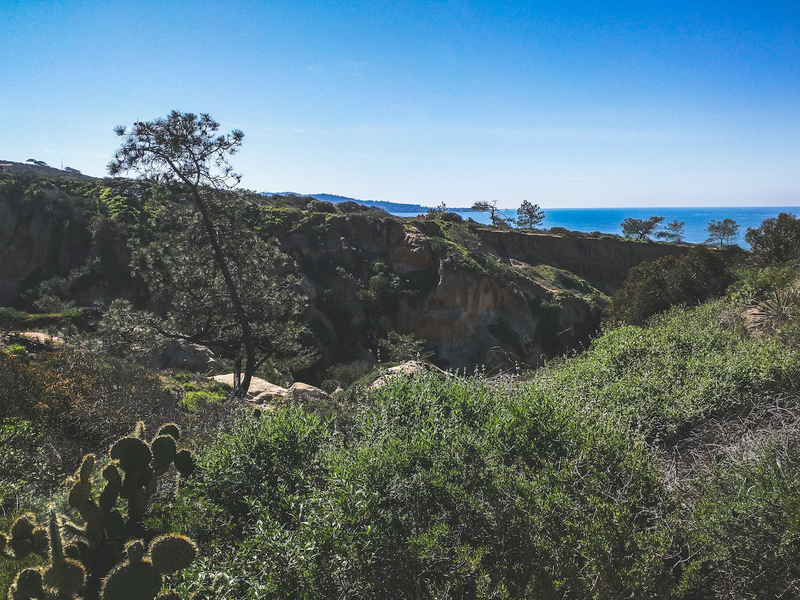 If you are looking for an easy, relaxing, family-friendly hike with constant views of the Pacific Ocean, Torrey Pines is for you. 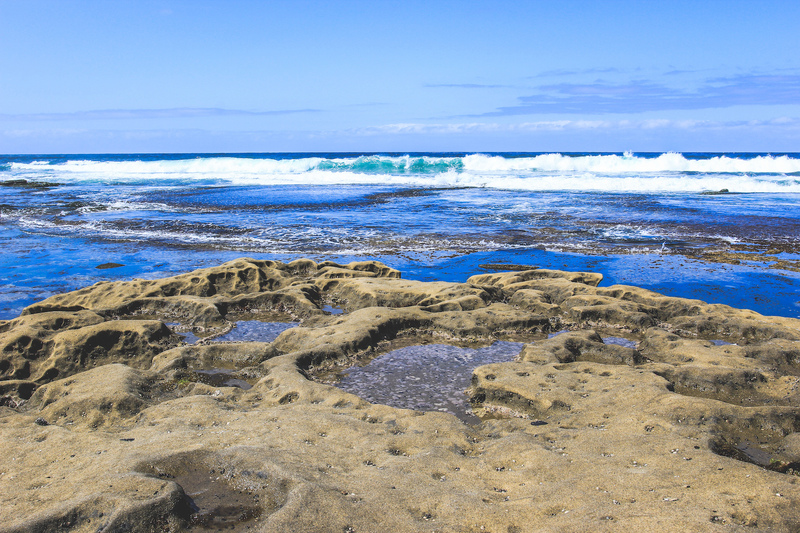 It is just over two miles of trail near the La Jolla area. It is very popular and heavily trafficked, so it may not be the quiet, peaceful sanctuary for more avid hikers. You can expect to see cacti, wildflowers, and enjoy that wonderful desert hike crunch under your feet. 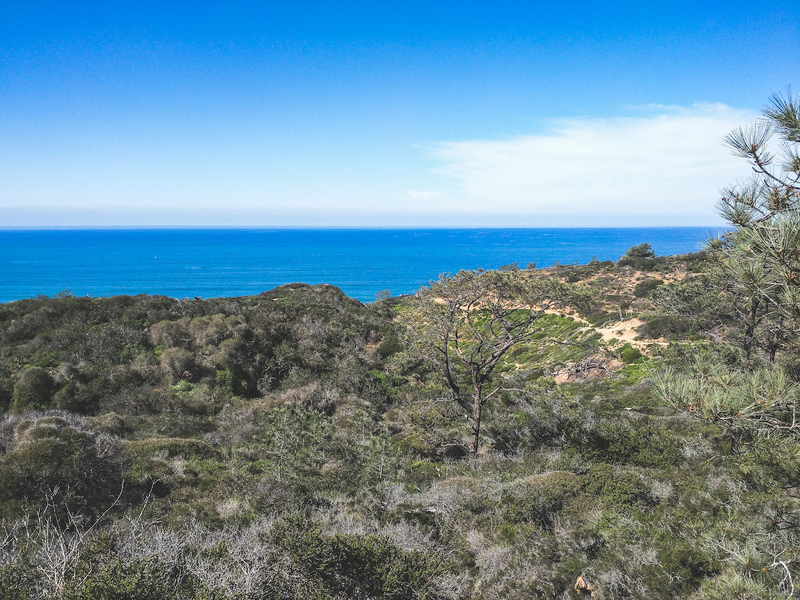 I enjoyed doing this light loop trail with my conference buddy, Cameron, and wandering down the many different paths one can take to explore Torrey Pines. The ocean views were worth the jaunt and the warm sunny weather was perfect that morning. While there were throngs of people across Torrey Pines on such a nice day, there were plenty of stretches of trail we had to ourselves. 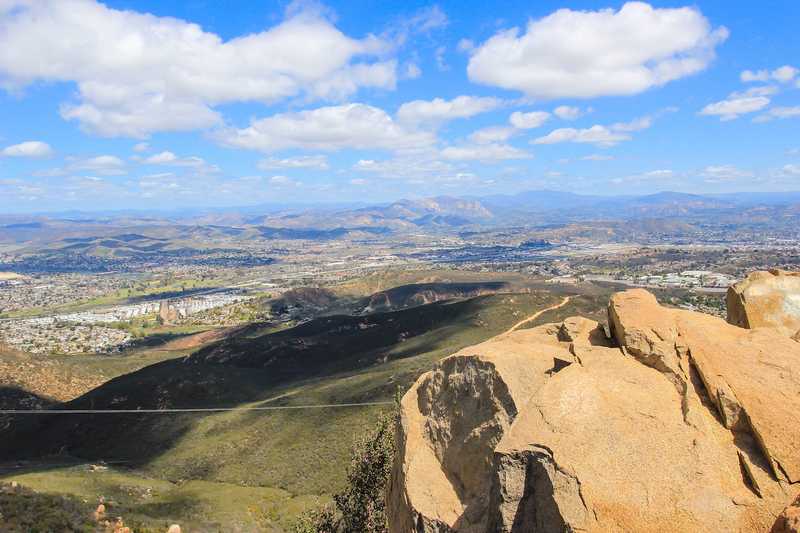 If you are looking for a more steep and challenging hike with fabulous views overlooking multiple cities, but short enough (4.4 miles round-trip, 2.2 miles each way out-and-back) to fit it in just about two hours, then Cowles Mountain via the Big Rock Trail is for you. This one was moderately heavily trafficked, and I encountered no fewer than three packs of douche-bros with radios in backpacks, but it was a very enjoyable hike. I went midday and was glad to have more than enough sunscreen and water on-hand. The hike starts challenging but not terribly steep, then picks up elevation about midway through and becomes noticeably more challenging. I personally love the uphill part of the hike – but when it’s this steep and smooth, you know it’s gonna be tough coming back down. When the ground is dry and crumbly, it is definitely slippery coming down this side of the mountain so watch your step! 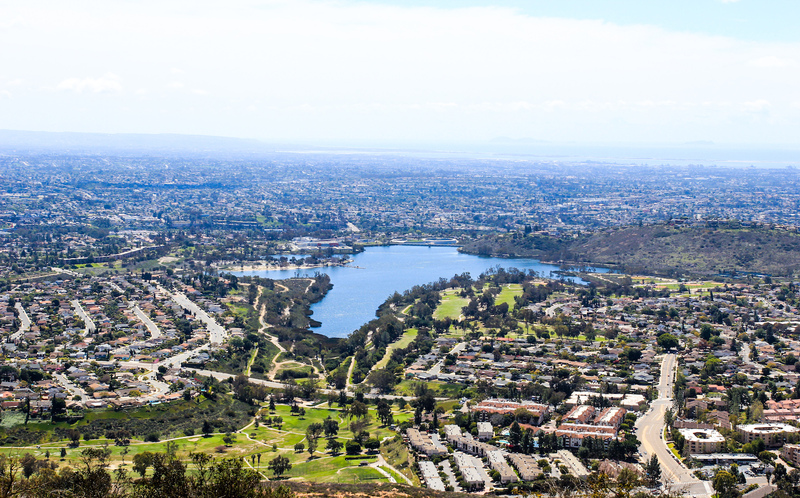 When you get to the summit at just under 1,600 feet, there are quite a few hikers hanging out, and there are several outlook points to appreciate the panoramic views, where you can see downtown San Diego, Point Loma, and even into Tijuana, Mexico. Side note: There were a lot of dogs on this trail, but please know that some dogs may not be able to handle the steepest parts of the hike. One dog in particular was struggling so badly I was worried it was in real danger. Its owners weren’t giving it adequate shade breaks or water, but they also needed to turn back instead of continuing to push the struggling dog up the mountain. From one dog parent to another, please be mindful of your dog’s health and physical ability – it can be risky for your canine companion. I am confident I got food poisoning at a certain pho restaurant in the Santee area, and I definitely don’t want to trash local business owners unfairly – all signs point to yes, this place was the culprit. I was super hungry after the 4.5-mile hike at Cowles Mountain and had my sights set on pho. 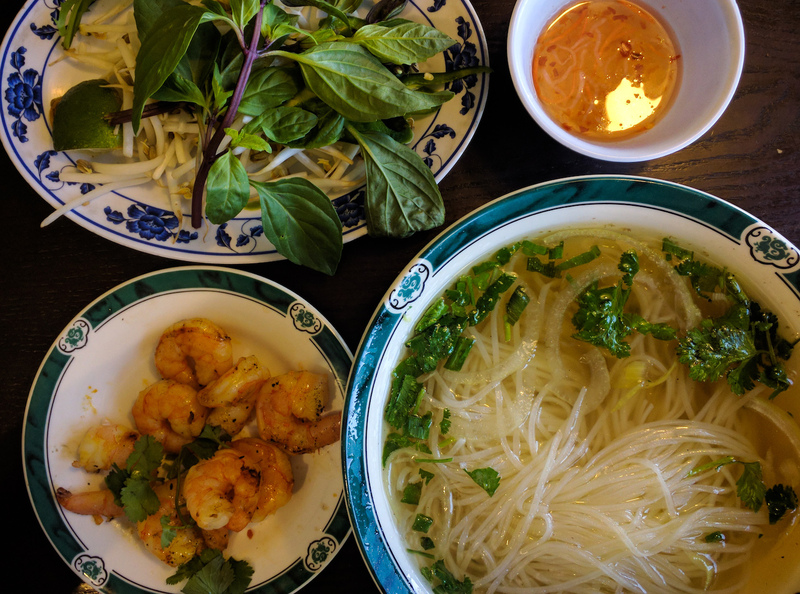 I found a well-rated pho joint in the Santee/Mesa area called Pho Ca Dao. It was in a strip mall and the place was pretty grubby when I got in there, but it was packed and I thought, “How bad could it be? Hole-in-the-wall restaurants aren’t always bad!” But it was food poisoning bad. For the record, I ordered their charbroiled shrimp rolls and pho. The service was adequate, the restaurant is highly rated (4.4 on Google, 4 stars on Yelp), the food tasted fine enough. But about 14 hours later I was in really bad shape, violently ill. I’ll spare you the details. I wish I had trusted my instinct based on the appearance of the place and left, and I should have dug deeper to filter down to the low-rated reviews where the food-handling safety and sanitation practices were called into question. It seems obvious now that I’m looking for it – I’m spotting quite a few things in the reviews that are super sketch. Ugh. If I only had a time machine. I spent a whole day missing an amazing conference and the after activities because I was holed up in my hotel room sick. But thanks a million to the staff at Paradise Point and my girl @BritneyMuller for getting me some emergency supplies to survive being poisoned – y’all the best. Two days later I’m still not quite back to 100%, but a little better each day. Side note: If you ever get food poisoning, don’t just suffer and complain in the Yelp reviews. Make sure you file a report with the local epidemiology board so they can investigate foodborne illness and determine if there is a food source problem or food safety problem that can affect many people. People can die from foodborne illness, don’t take it lightly. On my first visit to San Diego to hang out with family, my sister-in-law and her three kids walked me through downtown Coronado where we passed many of their schoolmates on the sidewalk, got donuts (apple fritters the size of our heads) and went to Coronado Beach to point at the ship out on the water, (“Dada is on that ship!”) and climb on the rocks. This beach includes the Hotel del Coronado, which is famous for being featured in Some Like It Hot (1958) with Marilyn Monroe. But the best part about it is just watching how much the kids love to run and climb and play on it. I got this recommendation from a local gal at the conference. When I finally got my appetite back, I wanted clean, healthy, gluten-free, vegan-friendly food only. This place was so yummy! I wish I had more of an appetite to have eaten every bite. I recommend the vegan coconut milk Thai iced tea – it’s even better than the condensed dairy milk version you are probably used to. I also had their spicy basil stir fry dish with brown rice and fried tofu. The spice was spot-on for me (they have a scale from 1 to 10 and I opted for 4). 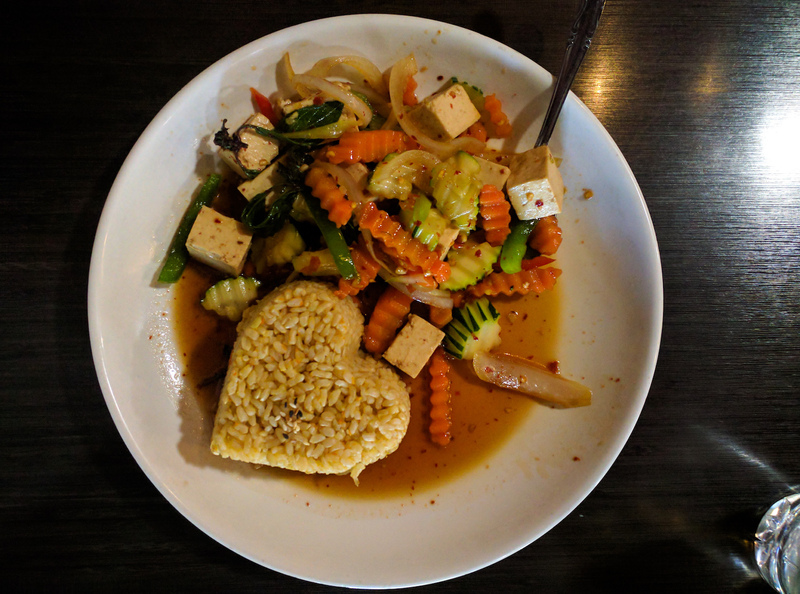 If the brown rice presented in the shape of a heart doesn’t make you crack a smile, I don’t know what would. The dish was flavorful, spicy, bright, and super special diet-friendly! It was a great, energizing meal to close my trip to San Diego. 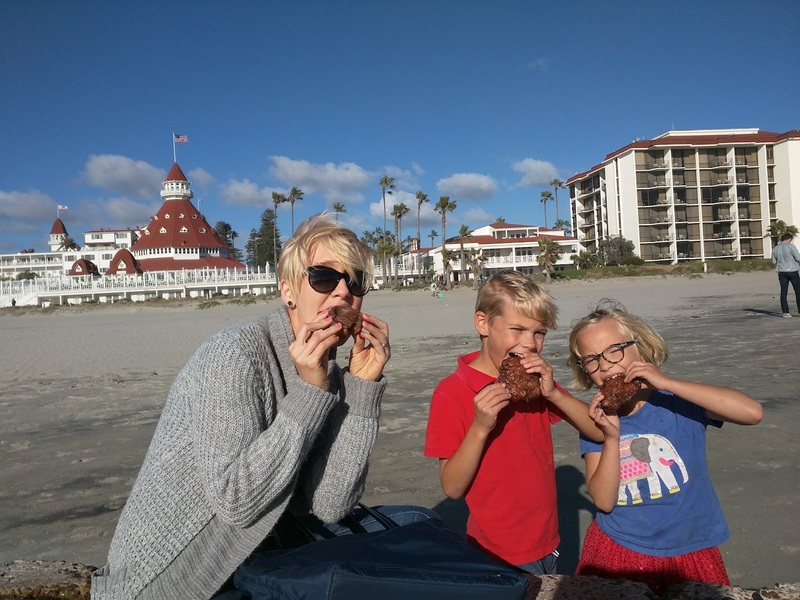 Some parts of my San Diego trip were better than others – I could have done without the brutal bout of food poisoning – but overall I have had a great time on both trips. My favorite parts were easily the two hikes and Balboa Park both times, as well as my meal at Ironside. It’s a great city to host a conference in, and I hope to explore the hikes on the outer edges of the city next time I visit!